Today while lounging around with Anya, she grabbed hold of my hand and started forming it into shapes. "What this letter?" she asked. 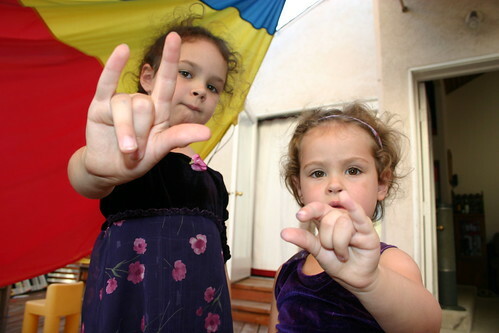 "How 'bout," and she curled my hand up to form a sign language "E", "this one?" Pulling up three fingers she asked and I told her she'd made a "W". Shoving down all but my thumb and pinky she asked, "And this one?" She pulled my index and middle finger up, entwining them together. "What's this?" She crossed the same two fingers again, a bit more emphatically. So she lowered the index finger, leaving just one standing tall. "Um, that's not a letter." I had to resist telling her she'd become very familiar with it as a teen and instead showed her another sign, one I'm hoping she'll use and have returned to her for the rest of her life. Newer PostHalloween is exhausting. Seriously, can I just admit that right now?